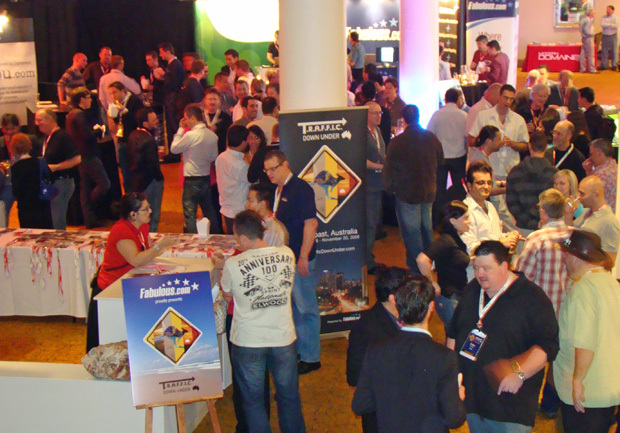 Domain owners from around the world converged on Australia's scenic Gold Coast November 17-21 for the first T.R.A.F.F.I.C. conference ever held outside the United States. T.R.A.F.F.I.C. 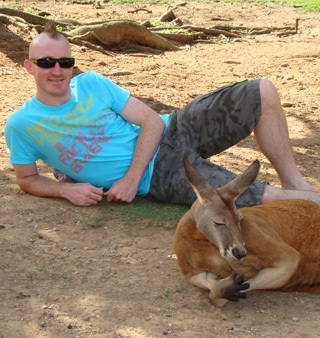 Down Under was ably staged by Brisbane based Fabulous.com under a licensing arrangement with T.R.A.F.F.I.C. co-founder Rick Schwartz and Howard Neu. Fabulous began promoting the show a year ago and they have worked non-stop on the project ever since, never letting up until the last attendee was headed back home. Throughout the process they promised to produce a world class event that would be worth the trip from anywhere on earth. They set a high bar for themselves but still managed to clear it with ease. over the unique adventures Fabulous took them on during the optional pre and post conference activity days on Nov. 17 and Nov. 21. 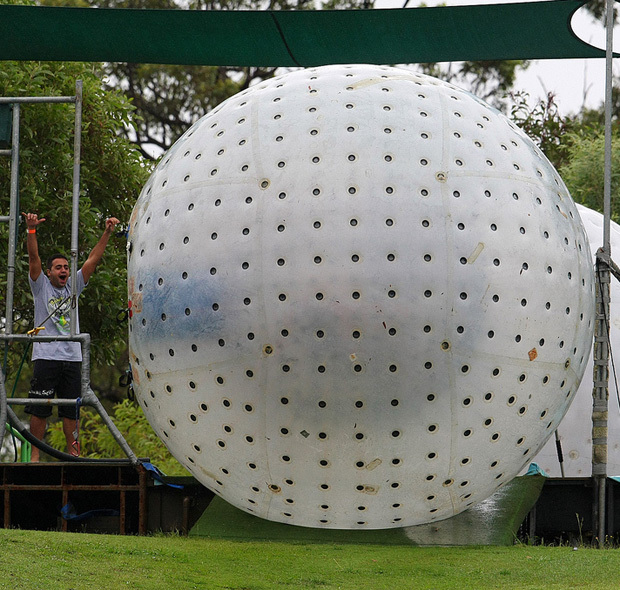 There was zorbing (climbing inside gigantic rubber balls to roll down a huge hill), paintball wars, go kart racing, surfing lessons and a trip to one of Australia's top wildlife sanctuaries. The conference business days Nov. 18-20 were also packed with non-stop action that included seminars, live auctions, parties and a cruise to a barrier island where an unforgettable afternoon and evening awaited. Mirage Resort - site of T.R.A.F.F.I.C. Down Under. travel hassles involved in getting from our home base in Tampa, Florida to the Gold Coast and back again. It meant traveling more than 24,000 miles round trip and if you spend much time on airplanes these days, you know most of the airlines go out of their way to make things as unpleasant for you as possible! 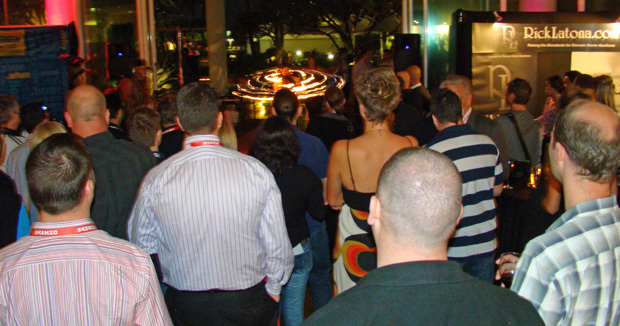 I got a chance to experience first hand what so many Australian friends have repeatedly endured to lend their loyal support and patronage to conferences held in the U.S. There was lost luggage, interminable delays, missed flights and other assorted headaches, but all of that was forgotten once I finally arrived in the southern hemisphere's version of paradise on Australia's east coast. day's pre-show special activities - zorbing, cart racing and paintball, but fortunately Fabulous had a professional photographer on duty throughout the week and covered my back by lending me some of their photos from those events. 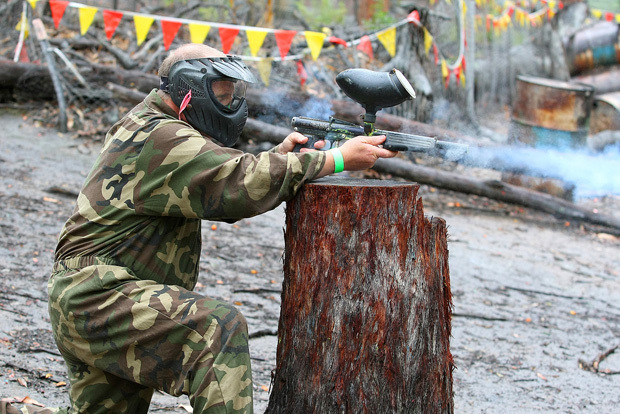 Domainer going for the kill in paintball war at T.R.A.F.F.I.C. Down Under. 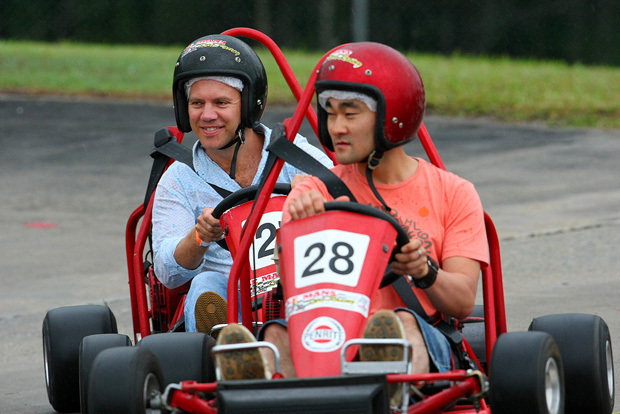 Kart racing - now this is more my speed - no flying bullets to worry about. Photo Above: Prepare to Zorb! 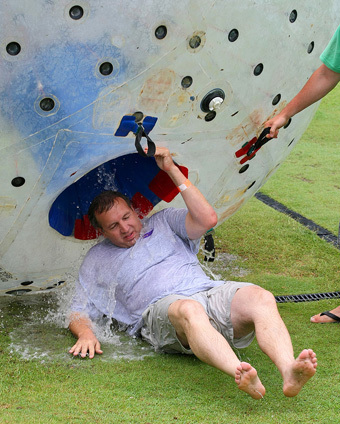 Two domainers are encased in this giant rubber ball as it heads for a wild downhill ride! At left: A zorber being expelled at the bottom of the hill. Though I missed the paintball battle, kart racing and zorbing, I did at least get there just in time to enjoy a welcoming cocktail party where reuniting with old friends and meeting new ones made the long trip seem like nothing more than a minor annoyance. It was especially enjoyable to meet in person, for the first time, many Australian domainers whom I had done business with online, chatted with in forums or simply repeatedly heard about ever since entering the business six years ago - people like Dean Shannon (the legendary founder of Fabulous.com's parent company Dark Blue Sea), Max Walker and Joe Honan to name just a few. Scene from the opening night cocktail party (Monday Nov. 17). The next morning (Tuesday, Nov. 18), Fabulous.com COO Dan Warner kicked off the opening day of business with a welcoming address in which he noted "we're here to, first and foremost, build a community, not to compete with one another. We are more friends and compatriots than we are competitors." That philosophy has always been at the heart of Fab's business model. As owners of hundreds of thousands of domain names, they hold one of the world's largest portfolios. In the course of developing tools to manage their own portfolio they decided "why not just share the platforms we have built for ourselves with the rest of the community". That resulted in them opening up their very low cost registration platform, a popular parking service and pioneering a new aftermarket platform with their registrar-based Domain Distribution Network. Their string of domainer-friendly products and services and the camaraderie their team members have always displayed has made Fabulous a very popular company with the domain community. 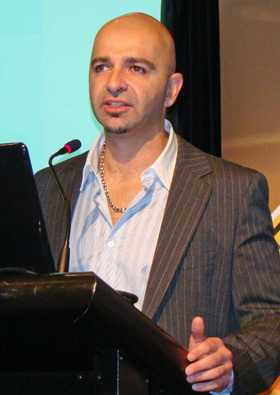 After Warner's comments, the first seminar got underway with four separate presentations related to Domain Strategy. Warner stayed on the dais to talk about Domain Economics, Thought Convergence COO Ammar Kubba delved into Mergers and Acquisitions, Michael Gilmour broke down Risk Analysis and Rick Latona detailed the Market Forces that are shaping the business today. Kubba was well equipped to talk about the wave of consolidation the industry has been undergoing over the past two years as his company was the buyer in one of the biggest deals to date, the purchase of Name Intelligence earlier this year. 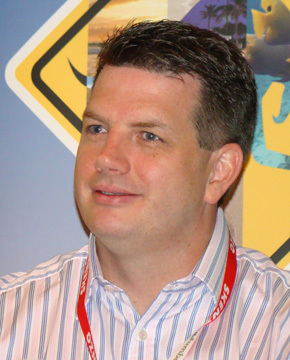 Kubba said this trend will continue because "there are too many parking companies, too many registrars, too many secondary markets and auction houses and yes, even too many conferences" (his company stages the Domain Roundtable conference). Looking out 6-18 months from now Kubba said M&A activity would be fueled by desperation as well as value. With the general economy in free fall he said assets are cheap and getting cheaper. As a result many will run out of time, capital or both and be forced to sell or merge. He said a new cash-rich entrant may enter the space (perhaps a Microsoft, Google, Yahoo, eBay or Amazon) to lock up domain traffic and/or commerce platforms at historically cheap prices. that Google doles out to domain owners for their traffic has declined by more that 7% over the past four years. He calculated that Google was paying out 37.2% in Q1-2005 but that figure had dipped to 27.9% by Q3-2008. Michael Gilmour Of course, as they increased their own margins, your PPC revenue has gone down. This is one reason pay per click revenue has been sinking at a time when Google and Yahoo have been raking in increasingly higher ad revenues - revenues that will continue to grow despite the massive downturn in the general economy. Though the growth rate in online ad revenue will slow down in the recession, it is still expected to jump by another 9% in 2009. In a question and answer session following his presentation, Warner underlined something that is becoming increasingly apparent to domain owners when he said "This year proved that we are at the mercy of Goggle and Yahoo and we have to change that." provided an opportune time to get in some extra networking, discuss what had been said in the preceding seminar or just find an out of the way easy chair to catch up on email or relax. The second morning session Tuesday (Nov. 18) covered Industry Development, a topic tackled by panelists Michael Collins (Executive Director of the Internet Commerce Association), Mark Klein (Director of Business Development at Sedo.com) and Mike Fiol (Managing Director/Analyst at DomainConsultant.com). Each addressed a specific part of the overall theme with Collins talking about Managing Community Risk, Klein dealing with Industry Standards and Self Regulation and Fiol throwing out some interesting ideas on Community Development. Mike Fiol speaks from the podium as Michael Collins and Mark Klein look on. With so much ground to cover in this overall conference review article, we can only touch on a few of the many points made in the individual seminars. A common thread touched on by all of the panelists in this session was the need to organize to protect domain owner rights while also helping stop abuses by a few that tarnish the reputation of the industry overall (with unethical domains, clear cut trademark infringement and click fraud among the ills that have to stopped). After a lunch break, the first of the conference's two keynote addressed was delivered by ICANN President and CEO Dr. Paul Twomey. Twomey said the decision to expand the T.R.A.F.F.I.C. conference series beyond the boundaries of the U.S. was a positive development and he thanked the T.R.A.F.F.I.C. founders for that. 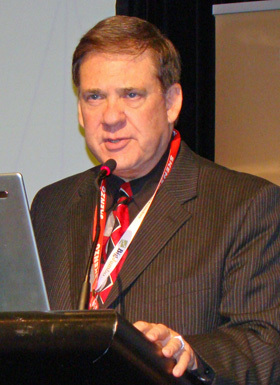 Twomey added that he thought the domain community had made great strides in professionalism and went on to call on domainers to become active particpants in ICANN by either joining existing constituencies (as several have done by becoming members of the Business Constiutuency) or by creating a new constituency of their own. 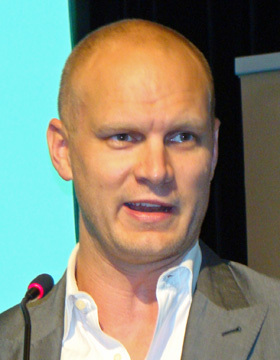 He said that ICANN offers "an open structure for domainers who want to have their voices heard." 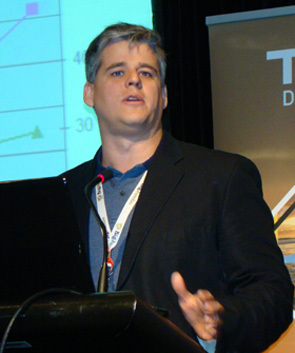 future held for the domain community, noting that the new gTLDs that are to start rolling out in the second half of 2009, and IDN TLDs (extensions that use local language character sets, not just the English alphabet), would present challenges but would also open up many opportunities. He predicted "an explosion of multi-lingual, multi-cultural content, ideas, social and business interaction, education and things we have never even dream of." Twomey said that true globalization of the Internet is being realized with the fastest growth and greatest potential lying in Africa, Asia and the Middle East. Immediately after Twomey's address, the first of two Tuesday afternoon seminars, Law & Regulation, got underway but had to proceed with one scheduled participant missing in action. A travel snafu kept Dr. John Berryhill from reaching the show until the next day (when he was able to deliver his presentation during a different session). T.R.A.F.F.I.C. Co-Founder Howard Neu, who is also an attorney and the ICA's Michael Collins carried on with the task at hand. 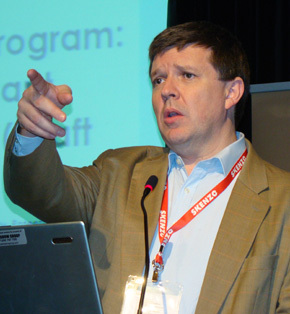 In his talk, UDRP & WIPO Unveiled, Neu dissected key UDRP and WIPO cases to give registrants an understanding of their rights and the issues they needed to be aware of should they ever face UDRP or WIPO proceedings aimed at taking away one of their domains. Collins offered an Interest Group Review that underscored the need for a strong domain industry trade association and he urged attendees to support and get involved in the Internet Commerce Association to meet that need. Without a strong trade association there will be no one standing between domain owners and those trying to modify or create laws that will make it easier for them to take away domains they are not entitled to. Following the afternoon tea break, Australian Domains took center stage with a four-man panel explaining the unique rules and regulations that govern the .au ccTLD space and discussing the prospects for the continue growth of the extension. The dais featured Chris Disspain, the CEO of auDA (the governing body for .au domains), Adrian Kinderis, CEO of AusRegistry (operators of the central registry for .au domains), Kartic Srinivasan, Product Manager for pioneering Australian registrar Melbourne IT, and Erhan Karabardak, Director for Cooper Mills Lawyers (a firm involved in all legal issues surrounding .au administration). The .com.au extension (reserved for business use) has enjoyed a high rate of growth, especially since tight restrictions on the extension were liberalized last summer. Sales and monetization of .com.au domains is now allowed (though you still have to be a registered Australian business to own them) and that has created aftermarket demand for .com.au domains (as evidenced by healthy sales in the live domain auctions held at the conference later in the week). You see the extension on billboards and signs throughout Australia. In 2002 .com dominated in Australia but the .com.au has now made significant inroads. The extension has been growing at a 25% annual rate and now has more than 1 million domains registered. Kinderis said an active marketing program helped turn the tide for .com.au (an example that other slow-growing ccTLDs like America's .us would do well to follow). Kinderis sadi AusRegistry launched an educational campaign to make sure businesses knew about policy changes that made the TLD more appealing and to inform them of how using .com.au domains could help their bottom lines. He said a variety of media platforms was used included radio, TV, print and direct marketing. 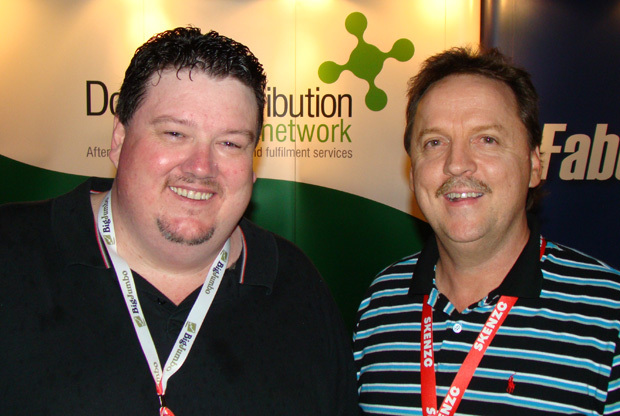 The end result is that Australians are some of the most loyal ccTLD users in the world. tried to bridge that gap by explaining the things that auDA takes into consideration before making a decision to revoke a domain registration. He emphasized that auDA has no bias against domainers or the previously prohibited practice of domain monetization through PPC programs. The Australian Domain session concluded the opening day of business. The big evening social event was to be an outdoor beach barbeque but that had to be brought indoors due to steady rain that began early in the day and never let up. 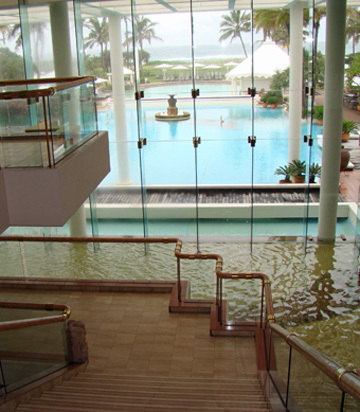 Thunderstorms and continual rainfall, a rarity at this time of year on the Gold Coast, would continue throughout the rest of the conference but show goers refused to let it dampen their spirits. 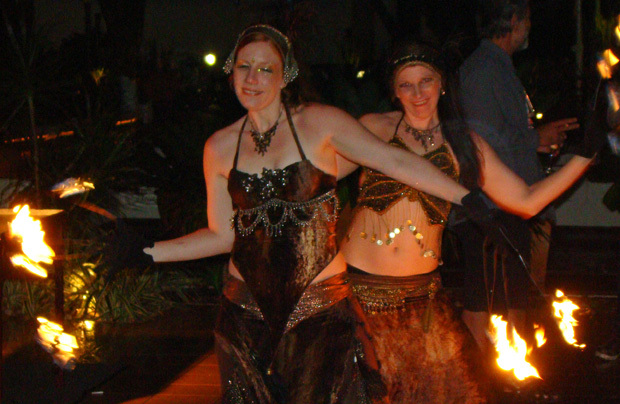 The party was moved inside complete with fire dancers and exotic animals that had attendees completely enthralled. 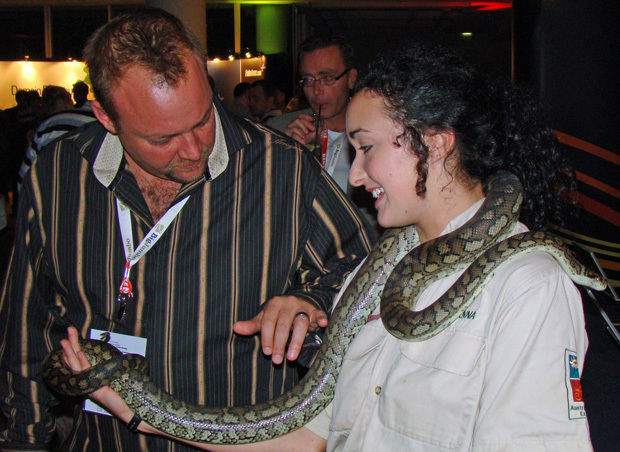 Below: Domainers were glad handlers didn't let any of the local wildlife get loose in the crowd! A great series of seminars (including one where the wayward Dr. John Berryhill finally turns up)! 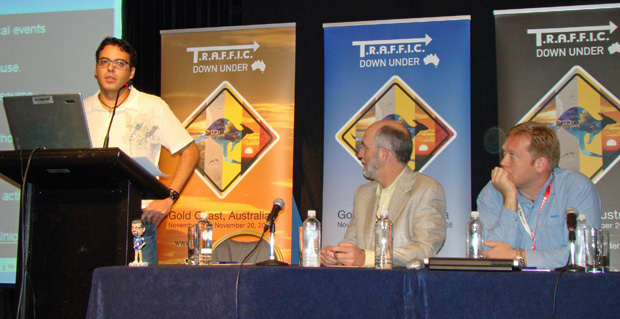 Keynote address from Graeme Wood, the founder of the groundbreaking travel industry website - Wotif.com. Tips from the experts on developing your own websites. An inside look at the live domain auctions. Photos from a spectacular island adventure that closed the conference on a high note. Copyright 2008 DNJournal.com - an Internet Edge, Inc. company.